COX’S BAZAR, BANGLADESH — Standing on a hilltop, Mintu Chandra Dey a local volunteer at the Balukhali Rohingya refugee camp, was waving a bamboo pole topped with a red flag. He was trying to draw the attention of a train of people to show them the right path to makeshift shelters that had been built at the far end of the Balukhali refugee camp. The Irrawaddy has learned that more than 25,000 new refugees have arrived at the camp since a repatriation deal was signed on Nov. 23. The signal from the torn flag seems at odds with the official story that the two countries are almost ready to start repatriating hundreds of thousands of Rohingya who fled Myanmar following a military crackdown against Muslim insurgents in Rakhine State in August last year. There are now more than 655,500 Rohingya Muslims who have taken refuge in the southern tip of Bangladesh, mostly in 12 makeshift campsites in Cox’s Bazar’s two sub-districts of Ukhiya and Teknaf. The land on which the Balukhali camp sits was forest a few months ago. While Google Maps still shows a green undulating landscape, the bare hilltops now sport a forest of colorful flags of the many different countries supporting a huge aid intervention. As far as the eyes can see are densely populated makeshift dwellings built on land that has been hurriedly cleared of vegetation, leaving the area vulnerable to mudslides on rainy days. On entering the camp, it is apparent that it is more organized than any of the slums in Dhaka in terms of keeping it free of garbage and with an apparently well-established drainage system, thanks to the management of the national and foreign aid groups. Along the web of pathways within the camps, people carry on with their daily lives, collecting and transporting aid supplies, hauling wood and other miscellaneous bundles, sitting by shops, and buying and selling goods. While talking with Amin, another refugee who gave his name as Abu Taiyab appeared. Formerly a fisherman in Rakhine State and the father of four, he appeared more open to returning. “If they provide us with citizenship rights we will go back home,” he said. Alongside a pathway in the camps, a little notice advertised the broadcast of a Barcelona versus Real Madrid football match in three different languages — Burmese, English and Bengali — scheduled for 2 a.m. The flyer was attached to the wall of a flimsily built shop selling tea, coffee, biscuits, betel leaves and so on. On top was a huge solar panel with a large battery that powered a television set. Inside the shop, which was bigger than many of the others around, were rows of wooden chairs. 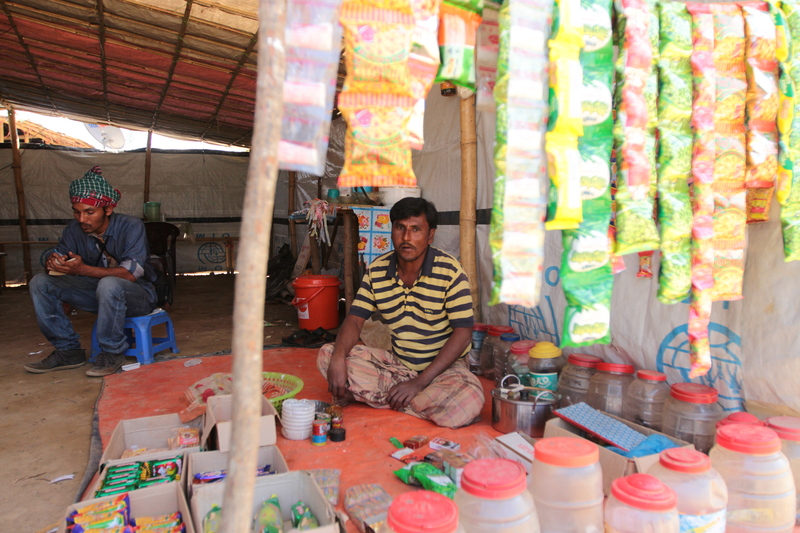 Shop owner Mohammad Karimullah said he had been a merchant back in Myanmar so he continued to ply his trade here. “I started with 1,000 takas. Sales are slow though — only 400 to 500 takas a day,” he added. In front of the shop, some workers were making a shanty for newcomers. Karimullah said the workers are typically paid TK150 to 200 per day. “The wage is low,” he said. There are a number of schools and Madrasas scattered throughout the camp, nearly all are full of children. The sound of chanting from the Quran can be heard often. Children in the schools were seen learning math by counting from one to 10. Mohammad Mia, 22, a local volunteer at the Daskinayan Child Learning Center-1, said a total of 111 children were being taught in three shifts a day at this one center. “Here we teach up to second grade,” he said. A new road connecting the Balukhali and Kutupalong camps is under construction. Microbuses ferrying aid workers and administrators shuttled in and out. Excavators were engaged in leveling hills to smooth the ride. Large areas are fenced off inside the camps for UNHCR officials. “This area is for office space for the UNHCR,” said Jafarullah, 25, a Rohingya refugee who has become a volunteer watchman for the UN refugee agency. There are many such fenced-off areas that have been set up to support the aid workers. Two adjacent bridges made of bamboo and wood span a tiny river that runs through the camps, allowing passage for pedestrians and bicycles. Although the camps look settled and supplied with sufficient aid, it remains a stressful environment. The agony of the Rohingya people here has been deepened by internal clashes, killings, and outbreaks of disease, which are considered everyday happenings. Amid the ongoing crisis, a much more detailed plan for the repatriation of the Rohingya refugees was announced by the Bangladesh-Myanmar joint working group on Jan. 16, as part of the deal signed on Nov. 23 last year. 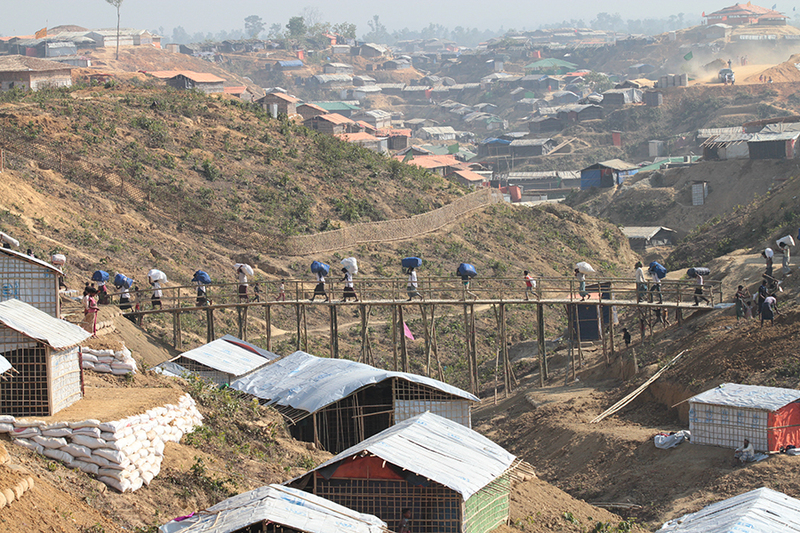 According to the agreement, Bangladesh would create five transit camps on its side of the border, while Myanmar would build two similar camps in its side. The treaty allows for the return of refugees who fled to Bangladesh since October 2016. Myanmar has initially agreed to take back 1,500 refugees a week with both governments committing to complete the return of all the Rohingya refugees within two years if possible. The initial steps have won some praise. But questions were raised as well. 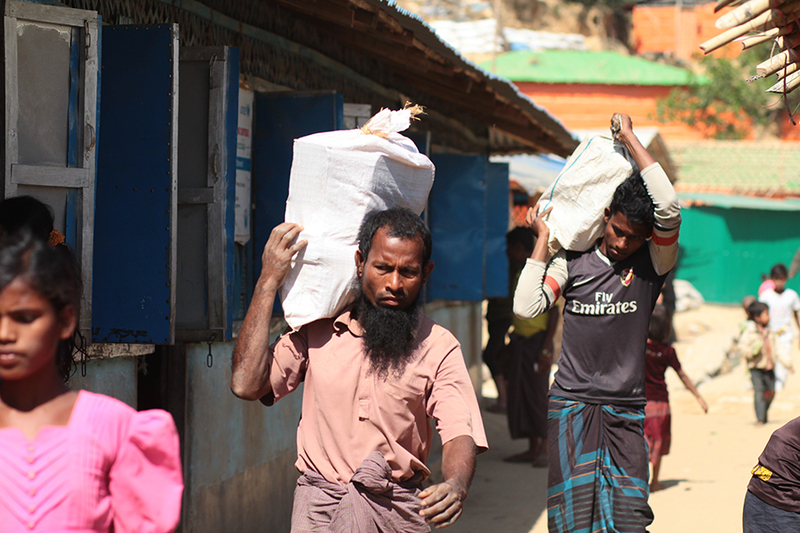 Local people at Cox’s Bazar noted that if Myanmar took back 1,500 refugees per week it implies only 78,000 refugees would be repatriated in 52 weeks. What then would happen to the rest of the refugees? Dainik Cox’s Bazar, a local newspaper, published a report on Jan. 23 claiming that there had been no safe and sustainable repatriations following similar crises in 1978, 1992, and 2005. It recalled that more than 4,000 Rohingya refugees verified by Myanmar in 1992 hadn’t been taken back despite pledges from Myanmar to do so. It also noted that Myanmar had begun building around 625 houses over an area of 125 acres in Foyekhong to house returning Rohingya refugees. Meanwhile, the beginning of the gradual repatriation of the more than 650,000 Rohingya refugees, which was supposed to have started on Jan. 23, has been delayed due to complications. Human Rights Watch 23 issued a press release earlier in January urging the suspension of the repatriation. “Rohingya refugees shouldn’t be returned to camps guarded by the very same Burmese forces who forced them to flee massacres and gang rapes, and torched villages,” said the organization’s Asia director, Brad Adams. Shirin Akhter, a communications officer at the International Organization for Migration (IOM) in Dhaka told this correspondent that the Rohingya are still coming. 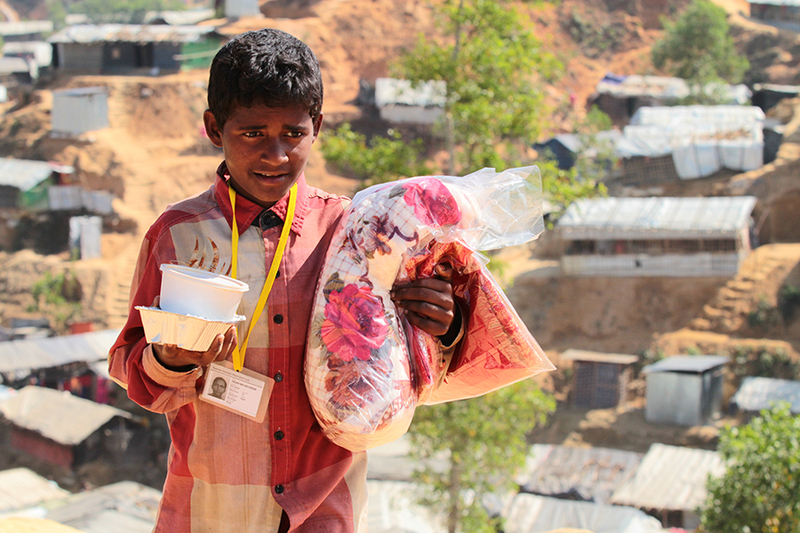 “We received 150 more Rohingya people yesterday [Thursday],” he said. According to news reports, the Rohingya refugees have staged at least five rallies in different campsites since Dec. 9 to bring attention to an eight-point list of demands including equal citizenship rights in Rakhine State. Without these demands being met, they said they wouldn’t go back home. The camps sit on around 3,000 acres of land divided into 20 blocks. The aid efforts and security have been coordinated by the local district administration. At least 93 local and foreign NGOs operate in the Ukhiya and Teknaf refugee camps. According to a reliable source, the administration recently deemed some NGOs to have been engaged in inappropriate activities and urged them to ensure accountability among themselves. The NGO Bureau subsequently banned some 12 NGOs from the camps for what it said were improper activities. Outside of the camps, there have also been demonstrations by local groups in favor of repatriation of the Rohingya. Though locals have welcomed the repatriation deal and have praised the humanitarian efforts by Bangladesh, they seem to be unhappy with the agreement at the government level. Cox’s Bazar Civil Society President Abu Morshed Chowdhury Khoka told journalists that the Myanmar people, Buddhist monks and the army in Rakhine State should be bound by commitments to their Muslim neighbors. He urged both countries to agree to a United Nation’s peacekeeping mission to support a sustainable repatriation. Refugee Relief and Repatriation Commissioner Mohammad Abul Kalam told this correspondent over the phone on Jan. 23 that the repatriation effort was ongoing. He said that before starting on the main task of repatriating the refugees a list would need to be compiled on the basis of family ties and then it would be coordinated at the village and regional levels. “We have been doing our best,” he said. Potential returnees are also required to provide some other essential documents such as card numbers, photos and lists of everything believed to have been destroyed in their torched Rakhine homes. However, the local volunteer Mintu Chandra Dey, reached by phone while filing this story on Friday, said he continues to guide new arrivals along the pathways to the Balukhali shanties on a daily basis. Nure Alam Durjoy is a Dhaka-based journalist contributing to The Irrawaddy.